The stage is all set for the launch of PSLV-C42 mission with two international customer satellites of Surrey Satellite Technology Limited, United Kingdom, on board from the first launch pad at Satish Dhawan Space Centre, SHAR, Sriharikota on September 16, 2018. NovaSAR, with S-Band Synthetic Aperture Radar (SAR), being prepared for insertion into the fairing. Antrix Corporation Limited, the commercial arm of the Indian Space Research Organisation, has been assigned the contract by SSTL for launching their two satellites, namely, NovaSAR and S1-4. 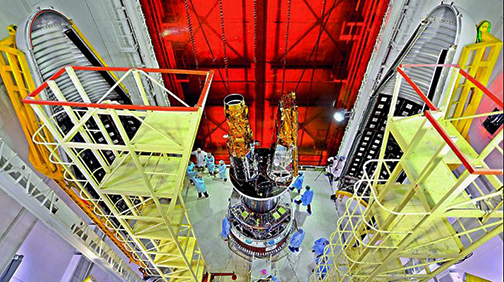 Photo of a PSLV-C40 series launch vehicle. Photo is courtesy of ISRO. 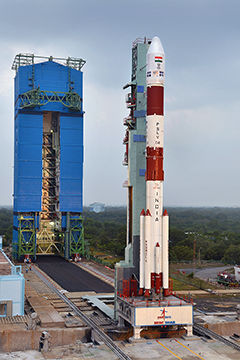 The plan is to launch both of the satellites with the PSLV-C42 launch vehicle into a 583 km. SSO. NovaSAR, with S-band Synthetic Aperture Radar (SAR), is a smallsat intended for forest mapping, land use, ice cover monitoring, flood and disaster monitoring, Ship detection and Maritime monitoring. S1-4 is a high resolution Optical Earth Observation Satellite used for surveying resources, environment monitoring and urban management.